The OnePlus 6T isn’t exactly old, but it’s definitely time to look ahead to the upcoming OnePlus 7. Or rather, three new OnePlus phones in the 7 range — if you include the upcoming OnePlus 5G phone, and believe the prevalent rumors that we’ll be seeing a “Pro” version of the OnePlus 7 for the first time ever. But whether or not those rumors prove true, new OnePlus phones always carry high expectations. With flagship-level specifications and good looks, paired with a price tag that’s decidedly not flagship, OnePlus’s phones have become something of a love affair for many. While OnePlus phones have been getting more expensive, the fact is that they’re still far cheaper than other flagship phones out there — making the upcoming OnePlus 7 range even more exciting. Here’s everything we know about the OnePlus 7. So when will we see the new OnePlus 7 range? The latest news comes from leaker Ishan Agarwal, and purports to show the announcement date of the OnePlus 7 range. This jibes with our previous estimations, which noted that since the OnePlus 6 was announced in May 2018, it seemed likely the OnePlus 7 range would be released around that time, too. As far as pricing goes, the OnePlus 6T came in at around $550, so it’s likely the OnePlus 7 range will start at around that price as well — though a price bump is likely. Giztop lists the OnePlus 7 at $569. Past OnePlus phones have sported strong cameras, even if they’ve never usually been up to the standard of the top flagships. It seems OnePlus is looking to up its game though, with the addition of triple-lens cameras to both the OnePlus 7 and the OnePlus 7 Pro. 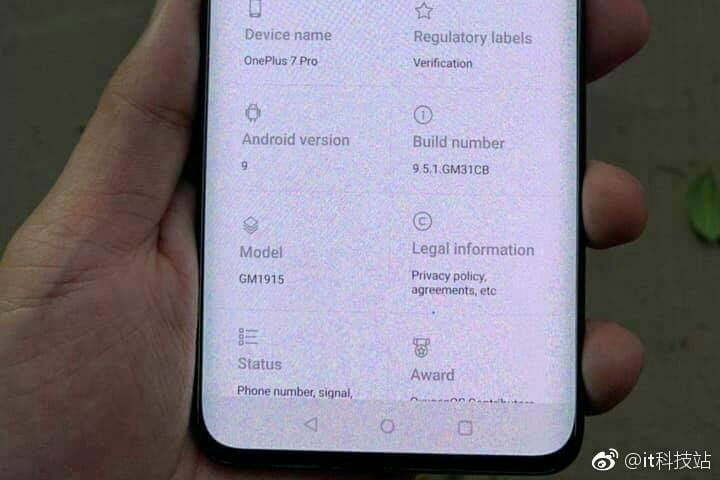 The leaked image reportedly from a OnePlus 7 Pro’s About phone page shows what we can expect from that variant’s camera suite. A 48-megapixel main lens is joined by a 16-megapixel lens, and a third 8-megapixel lens. Details on the specifics of the lenses aren’t known at the moment, but it’s likely the second lens is a wide-angle lens of some sort, while the final 8-megapixel lens is most likely to be a 2x telephoto zoom lens. The OnePlus 7 has a slightly different triple-lens setup, if Giztop’s store page is to be believed. 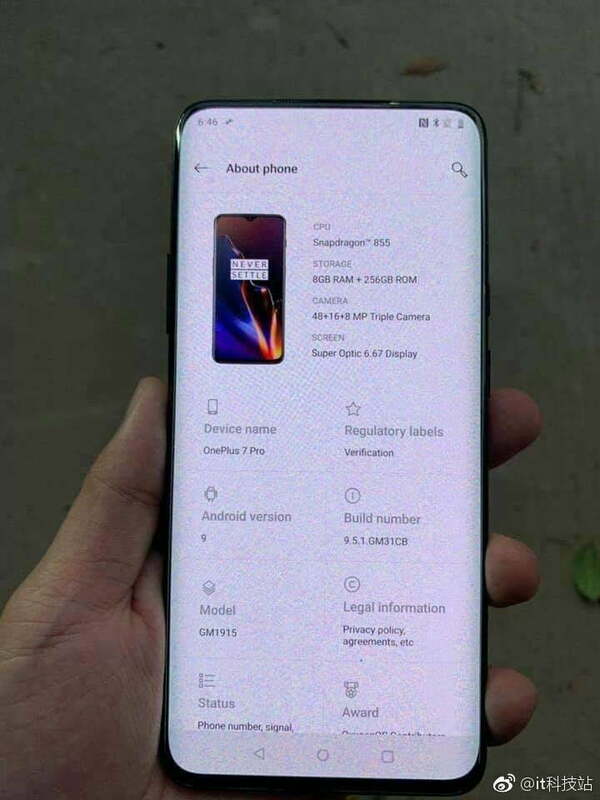 That listing claims the OnePlus 7 will come with a 48-megapixel primary lens, joined by a 20-megapixel secondary lens, and a 5-megapixel tertiary lens. The pop-up selfie camera is also listed as 16 megapixels. It seems odd that OnePlus would pack the more powerful version of the phone with an inferior secondary lens though, so it may be advisable to take that listing with a pinch of salt for now. What will the OnePlus 7 and OnePlus 7 Pro look like? 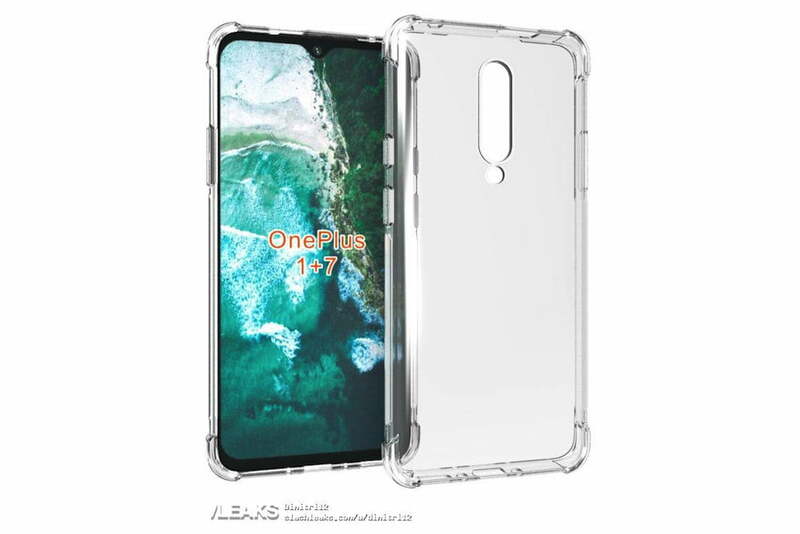 It now looks certain OnePlus will adopt a new look for its newest range, and that new design seems set to use a mechanism to hide the front camera, allowing for both phones to rock a full-screen display without a notch. We have seen this approach on the Honor Magic 2, and the Xiaomi Mi Mix 3, and also on the Vivo Nex S.
The latest renders showcasing this look come from Slashleaks contributor Sudhanshu Ambhore, who posted a series of tweets containing renders from a case manufacturer. It shows a stunning display that covers the entire front of the phone, with an extremely slim bezel running along the bottom. There are holes along the bottom of the case for the SIM card tray, USB-C port, and speaker. The headphone jack is still gone, as it has been since the OnePlus 6T. The back of the phone shows a vertically stacked triple-lens camera. Giztop’s store listing claims the AMOLED display will be 6.5 inches. Interesting to note is the addition of a large hole in the top of the case — which allows the mechanically rising selfie camera to operate, even with a case on. 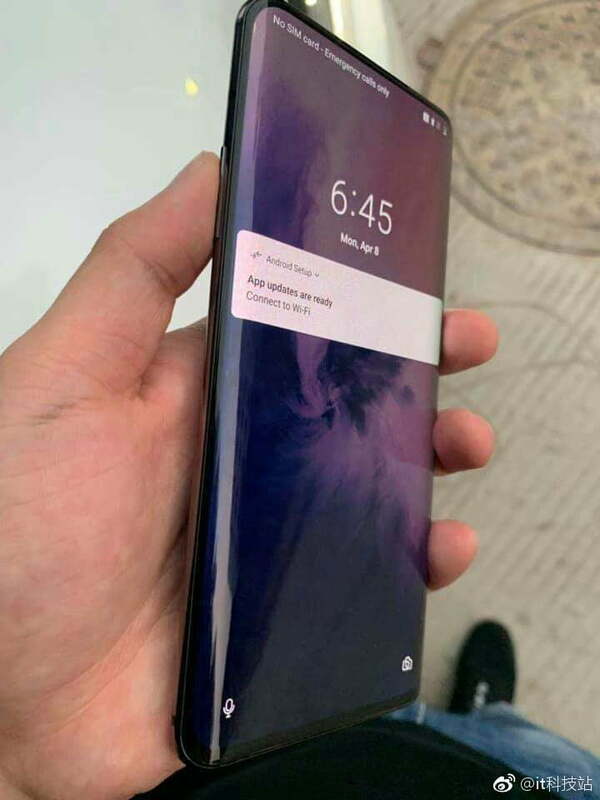 It seems the OnePlus 7 Pro will mirror this design for the most part, but will add rounded edges in the same style as Samsung’s Galaxy range. We saw a snapshot of this design in a leaked pair of pictures from the social media site Weibo. 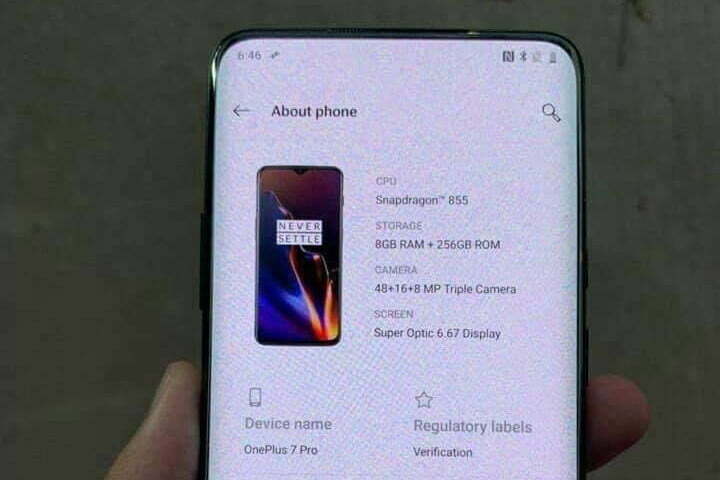 Captured by the picture of the specs identifying this phone as the OnePlus 7 Pro, the phone sports rounded edges, and a stunning design with almost no bezel around the display. It also confirms the phone will sport a massive 6.67-inch AMOLED display, making it the slightly larger of the two phones. 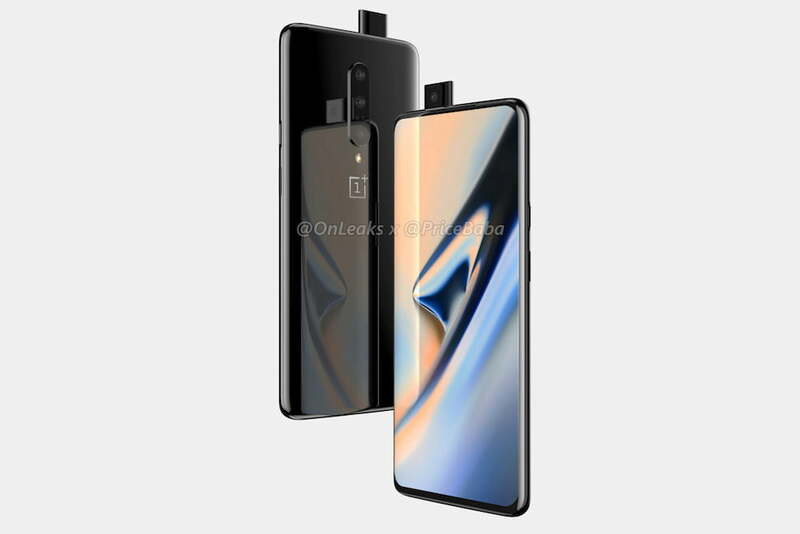 This also makes it likely the renders posted earlier in the year show the OnePlus 7 Pro, rather than the OnePlus 7. The render came at around the same time a case render was also leaked, which concurred with the vertical, central camera layout seen above, and has a cutout for the pop-up camera module, too. 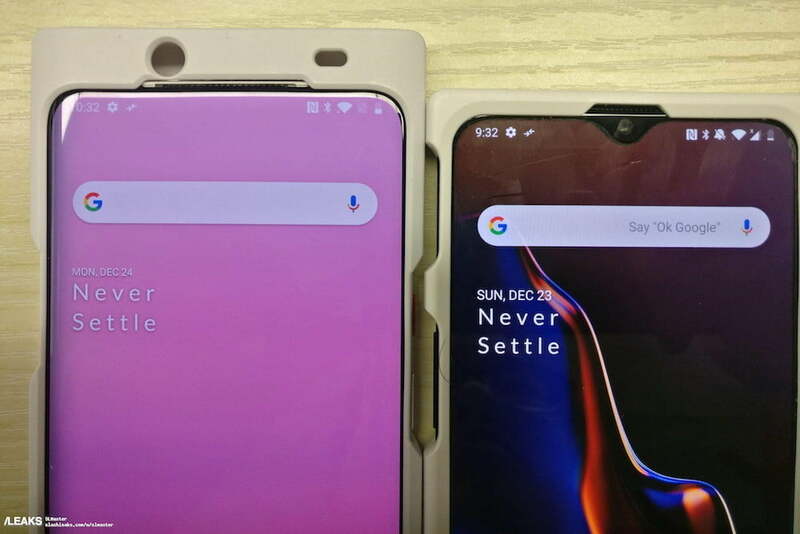 Before all this, an image published by SlashLeaks, showed two phones in a plastic casing, one with a “slider” mechanism that’s closed, and the other with it open. Cutouts for the camera and its sensors rise above the screen and speaker. OnePlus puts most of the latest and greatest components into its devices, so what can we expect from the OnePlus 7 and OnePlus 7 Pro? 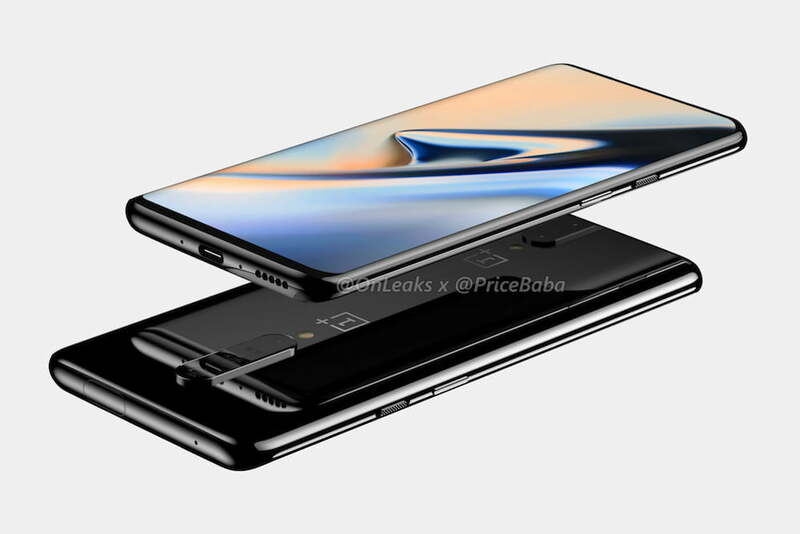 Thanks to leaked images from Chinese social media site Weibo we have a fairly strong idea of what to expect from the OnePlus 7 Pro. According to the image, that variant will come with the Snapdragon 855, 8GB of RAM, and 256GB of storage. The Snapdragon 855’s addition is unsurprising, as OnePlus CEO Pete Lau confirmed that processor at Qualcomm’s annual Snapdragon Summit. Previous leaks had also suggested the phone range would have either 8GB or 12GB of RAM, and it’s possible both variants will come with options for 8GB and 12GB. The same source — an online retailer — states the phone will have a 4,000mAh battery with fast charging, and a choice of 128GB or 256GB of storage space. The phone won’t have wireless charging though, according to OnePlus CEO Pete Lau at MWC 2019. Lau said wireless charging is an inferior version of cable charging, and isn’t something OnePlus is looking to implement. OnePlus prides itself on its fast cable charging, and boasts of being able to refill 50 percent of a battery in just 20 minutes. Updated on April 16, 2019: The OnePlus 7 range seems set to launch on May 14.